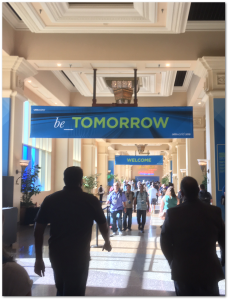 VMworld 2016 was last week. It was my first time attending. I worked in a VMware booth in the Solutions Exchange. I had never been able to go when I was on the customer side. That fact was not lost on me during the week. As I flew home, I wrote down some thoughts about the week. It was a new experience for me. There was a fair amount of hard work, a good bit of fun; but most importantly I was able to observe interactions and discussions between people. That was by far the most interesting and important part. About mid way through the week, I was able to meet up with one of my customers that had attended. I am relatively new to the account so I had not had a lot of face time with them yet. It was good to get a chance to talk with them outside of their workplace. During our conversation, it came out that they had recently begun looking to leverage vSAN as a way to increase their High Availability potential. Utilizing a stretched vSAN cluster, they could extend their High Availability capabilities outside of a single building. Their manager was not quite yet sold on the idea. He was hoping to validate this use case for the technology and was wary of being the first to try something new. I introduced them to a vSAN subject matter expert who was also at VMworld. As I watched the conversation, the SME started to draw a diagram on a whiteboard, and suddenly exclaimed – “I know 2 people at VMworld who are already doing this in production. Can I introduce them to you?“. He grabbed his phone and sent a text message. A few minutes later another small group showed up. Introductions were made and then the conversation began – heads began nodding and light bulbs were going off. Later that evening, I received a text from my customer thanking me for connecting them. They had a very valuable conversation that day. Not only had they received some real world validation of their ideas – their universe had just expanded a little bit. The team they had been introduced to worked less than an hour away from their main campus. On Thursday, I was able to wander around a bit. My booth duties had been completed, and there were still a few breakout sessions and hands-on labs available. I sat down at a lunch table to get something to eat and browse the schedule. Another person was already at the table; but was on the phone. A few minutes later, his call ended and we introduced ourselves. He works for a mid-sized business, and had recently taken on responsibilities for their virtual infrastructure. This put him in a position where he had to learn on his own. After working at it for a while he achieved his VCP certification. There were some areas he still wanted to grow in – hence his trip to VMworld. On his flight out, he was making small talk with the person sitting next to him. It was at this point he learned the person sitting next to him was a Technical Marketing Manager for one of the Storage & Availability products. They pointed him to the vBrownBag podcast (and gave him a sticker to help him remember). They even suggested one or two sessions for him to attend as a way to grow his knowledge. My lunch companion was very impressed at the approachability and accesibility of VMware’s resources. It made a very powerful impression on him. This echoes my own experiences as a new VMware employee. I was amazed at the employees who stopped at my booth during my shifts. Product Managers and developers would stop by after a breakout session to hear the questions people had. They would often jump in and help answer questions or add technical depth. It was amazing to see the discussions that occurred. Start now – You are the one one living in your environment – implementing solutions and fixing problems. The daily grind is the place to find the reasons for going. Keep notes – Areas where performance can be increased or persistent problems that won’t go away are key pain points. Don’t rely on your memory two months prior to VMworld. Keep a list throughout the year to help you build a case with your manager. Build an event plan – You did take notes – right? Use them to build a plan of how you are going to help your company solve issues. This shows that you have a plan that is focussed on helping the business. You may not find a resolution to these problems during the show; but be prepared to talk to people You ever know who you might talk to: It could be a developer who wrote the code behind the technology, a seasoned engineer with years of experience, or the product manager responsible for the direction of the product.. They just might have an idea of how you can proceed that you may have missed. Bring back knowledge – Planning a brown bag lunch session of your own to share knowledge with others back in the office is critical. This helps grow the entire organization. Plan to meet new people – and then do it. Sit at a random lunch table and start a conversation with people you don’t know. This is the advice of more seasoned veterans than myself. I have tried their advice – it really does work! Choose at least one Hands-on Lab. These are seriously worth the time. The people who set these up and assist are out of this world. Pick at least one completely new subject. This will help expand the breadth of your knowledge as well as the depth.